This chapter addresses questions that might arise as you develop a receptive skills assessment task. We begin by suggesting several task types that might be useful in your classroom, before demonstrating how you might use the CLB 2012 document to align your task to the abilities of the learners in your class, and to select your assessment criteria. We end by discussing special concerns related to setting up receptive skills assessment tasks. How can I Develop Assessment Tasks that Reflect Real-World Concerns? In order to assess learners’ receptive skills, you will need to develop assessment tasks that allow learners to demonstrate real-world listening and reading skills, skills that will be useful in interactions outside of the classroom. While we have traditionally assessed listening and reading skills with comprehension questions, they are not the only means of assessing comprehension. After all, outside of the classroom, we seldom listen or read in order to answer a series of questions. We listen and read to do something: to engage socially, to complete tasks, or to find answers to our own questions. These purposes can be adapted when developing assessment tasks, to provide learners with relevant and motivating opportunities to demonstrate comprehension. Several options are listed below, with corresponding learning and assessment tasks. As with all assessments, you can use the CLB 2012 document to check that the listening or reading assessment task and the related assessment criteria align to the CLB level(s) of the learners in your classroom. The steps below outline this process using the example task, Listen and Respond to a Complaint from a Friend, applied to a work situation, one of the sample tasks suggested for listening at Benchmark 7. The CLB competencies are organized into four Competency Area(s) located to the right of the Profile of Ability for each benchmark; for listening and reading these include Interacting with Others, Comprehending Instructions, Getting Things Done, and Comprehending Information. As a first step, select the competency area(s) that most closely reflects the purpose of the task. For example, in the task Listen and Respond to a Complaint about a Work Situation from a Friend, the purpose is to build/maintain relationship, so Interacting with Others is appropriate. In cases where a task conceivably draws on more than one Competency Area, you might choose to assess both or only one, based on your judgement of which is the most relevant to the task and to the larger goals guiding the class, as determined in early and ongoing needs assessments. Determine if your task is level appropriate. Once you have selected the assessment task, you should confirm that the task (and your expectations) are appropriate for the CLB level of your class. This involves a scan of the Profile of Ability, Some Features of Communication, the appropriate Competency Area(s), and the Knowledge and Strategies page. 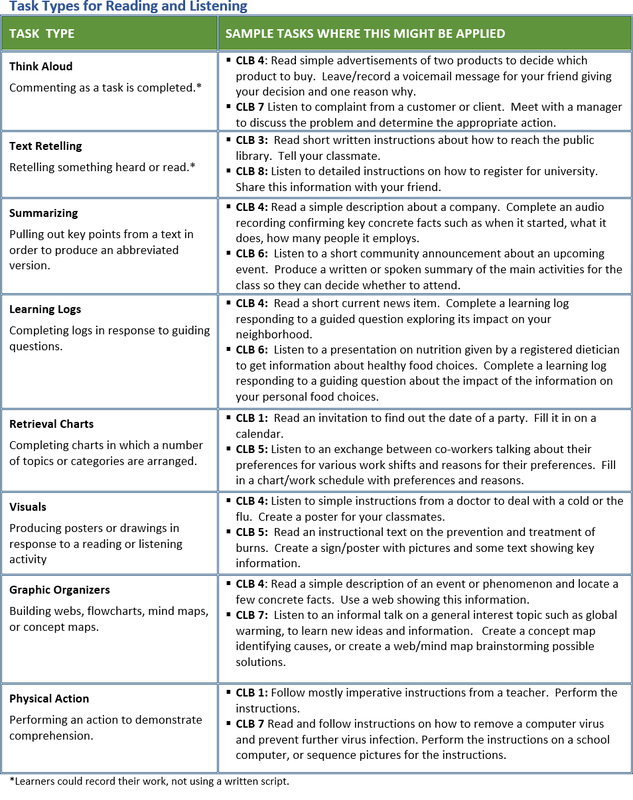 The Profile of Ability is listed on the left of the page for each listening or reading benchmark (and also provided in table form at the beginning of each Stage). 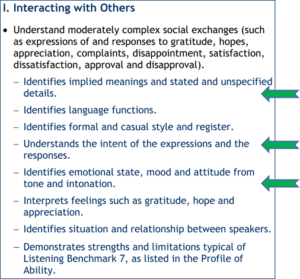 If your task is at Listening Benchmark 7, for example, the Profile of Ability (pictured in partial form here) indicates that learners would be expected to understand most moderately complex informal communication related to life experience. The expectations for the communication indicate that the interaction should be spoken at a normal rate, face-to-face (or on the phone or via digital media), and of moderate length. These considerations would help instructors set up the sample task to allow learners to listen and respond to (or participate in) an exchange spoken at a normal pace that would draw on the listener’s life experience. 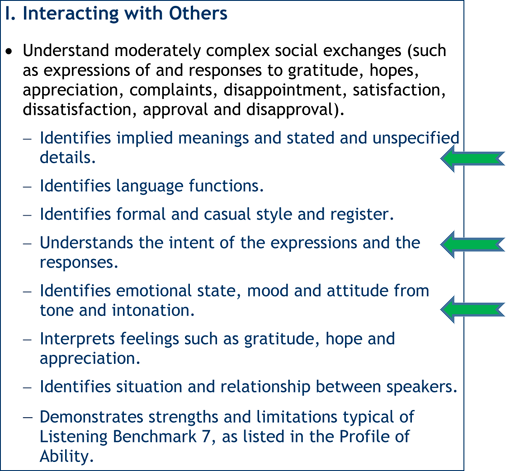 The Profile of Ability also describes the strengths and limitations of communication demonstrated by learners at this Benchmark. It indicates learners would be expected to understand overall meaning or intent, a range of vocabulary (e.g., concrete and abstract language), an expanding range of register and styles, and an increased range of complex sentences and structures. These descriptions help clarify the complexity of a task at this level. 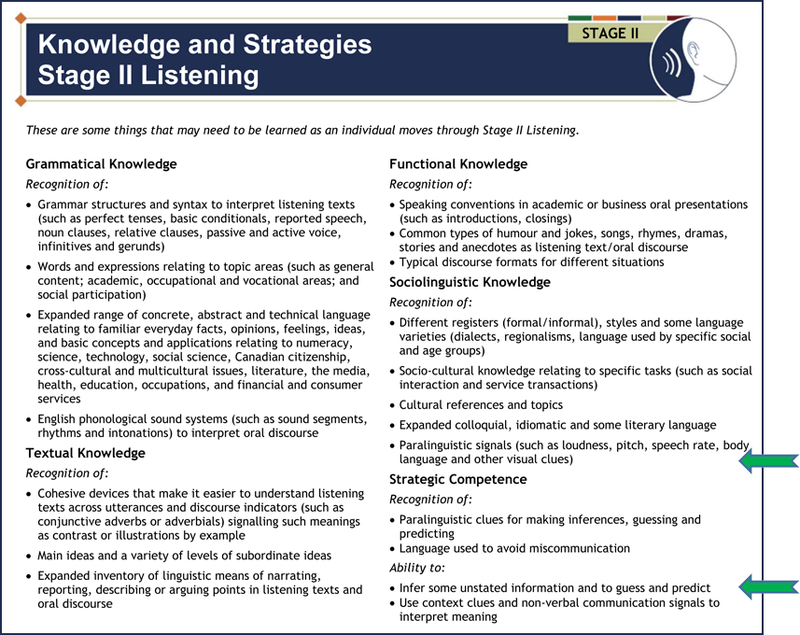 The Some Features of Communication table for listening, found at the end of Stage II Listening (with the CLB 7 column presented to the right) expands on characteristics of communication for each Stage II benchmark. At Benchmark 7, the Features of Communication table stipulates several relevant features of communication. For the example task, Listen and Respond to a Complaint about a Work Situation from a Friend, the features indicated by the arrows in the chart may be particularly important: speech is clear and at a normal rate, it might include some less-common idiomatic expressions, and the response to the task may require some speaking or writing. As a next step, you might scan the Competency Statement(s) and Sample Indicators of Ability of the selected Competency Area(s) for additional information that confirms the task is level appropriate. The Competency Area Interacting with Others states that learners should be able to “Understand moderately complex social exchanges (such as expressions of and responses to…complaints…)”, an expectation consistent with the task, Listening to a Complaint from a Friend. 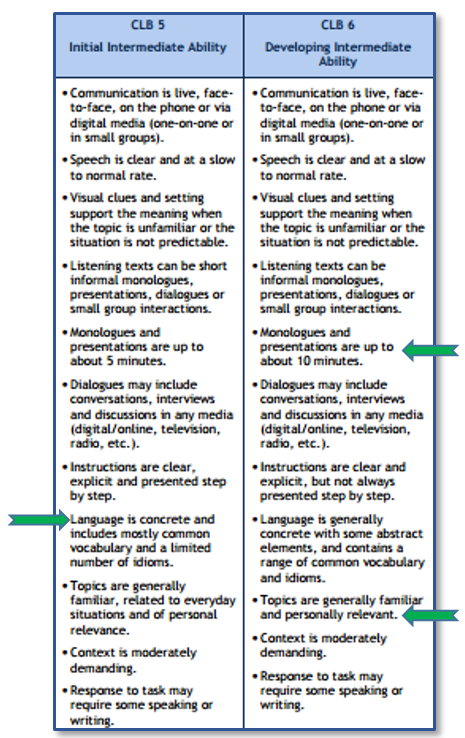 The Sample Indicators of Ability for listening are listed in blue under each Competency Statement. The box immediately below presents the Competency area Interacting with Others. The indicators indicated by arrows would be relevant to the task: identifies implied meanings, understands the intent of the expressions and responses, and identifies emotional state, mood and attitude from tone and intonation. For additional indicators that may be appropriate to the task and benchmark, you should also review the Knowledge and Strategies page for the Stage, reprinted below. In the task Listen and Respond to a Complaint from a Friend, you might select the items marked by arrows below. Note: When selecting indicators, remember that those identified in the CLB document are samples, providing “an overall sense of the types of requirements that may arise from a task… the actual indicators for each authentic language task are determined by the purpose and context of the communication” (CCLB, 2012a, p. XVll). Choose criteria most critical to effective comprehension in this task. For example, at CLB 7 when reading an article about a current event, it may be important to distinguish fact from opinion and evaluate the ideas to draw conclusions rather than focus on identifying the facts. Ensure the assessment criteria are tied to the learning goals for this unit of study. Ensure the assessment criteria related to classroom teaching and learning. For example, if the assessment task will require guessing the meaning of words from context clues, strategies for doing so will have been taught (or reviewed) in class. Choose a manageable number of criteria for learners and for the person giving feedback. Adjust the criteria for learners who are working at a higher or lower CLB level. Express an opinion appropriate to the situation. Finally, when developing the task, ensure that what learners are asked to do relates to the assessment criteria that you have selected. In receptive tasks, unlike productive assessment tasks, instructors generally include assessment criteria and feedback on the task itself, rather than using a separate form to record results. In Classroom 2, Kathy and Carly embed the assessment criteria in the task. On the listening assessment tool, the relevant question numbers are listed after the criteria listed at the top of the page. In the reading task, the criteria are clearly incorporated in the directions for each part of the reading task. As an alternative, for either receptive task, criteria could be indicated in a separate box on the assessment task, as is illustrated by this listening assessment tool contributed by Diana Ishigaki. If the purpose of the task is assessment of learning, you will need to decide what constitutes success. One approach would be to highlight which criteria must be met to achieve success. Another would be to assign a numeric score, in which case you will need to indicate the overall score or percentage required for success. You might consider weighting the most important assessment criteria more heavily than other criteria. For example, in a CLB 5 reading task, interpretive and applied questions (as defined below) may receive greater weighting than questions focused on finding details. If you are using a numeric score, you will need to decide what score indicates success. What Special Considerations Arise when Setting Up Receptive Skills Assessments? In this section, we discuss three issues related to assessing comprehension: distinguishing levels of comprehension, choosing comprehension questions, and selecting level-appropriate texts. Literal: which involves understanding the specific information in the text. Interpretive: which involves integrating information and making inferences. Applied: which involves using information from the text to express opinions and form new ideas based on information in the text (Vacca, Vacca, & Mraz, 2014, pp. 226-230). These levels of comprehension are embedded in the CLB, but are not explicitly identified as such. CLB Stage 1 emphasizes the first two levels of comprehension, literal and interpretive, with some easier applied questions later in the stage, at CLB levels 3 and 4. CLB Stage 2 emphasizes interpretive and applied levels. The table below might help you assess comprehension at appropriate levels for the learners in your classroom, preventing a focus on literal question/task types at higher benchmarks, or the use of overly difficult questions/task types with learners at lower skill levels. If you use comprehension questions, you have many options. Several are described below, along with their advantages and disadvantages. Short Answer Questions can be easier to construct than other question types, but responses may be difficult to mark, and several correct answers may be possible. In addition, if the questions aren’t worded simply at lower levels (CLB 1 and 2), learners may not comprehend the question, and this will interfere with your ability to assess their text comprehension. Additionally, instructors need to ensure that assessment is based on comprehension of the text, and not writing skills (spelling, grammar, etc.). Multiple Choice Questions are easy to grade, but difficult to construct. Questions require one correct answer and plausible distractors, all in parallel form. In addition, learners might guess the correct answer; you will not know if they could have answered correctly without the prompt. True/False Questions can be simple to construct, but learners have a 50% chance of guessing the correct answer. To add challenge, you could require learners to correct the false statements. Sequencing Activities (unscrambling the order of items or sequencing items with numbers) can be useful at low levels because students are not required to write long responses. However, making a mistake with one item in the sequence may produce a domino effect: one wrong answer can lead to other wrong answers. Matching Activities can be effective in assessing whether learners have understood the main information, without asking them to write. However, one incorrect answer can also produce a domino effect; to reduce this effect, you could add extra items in the response column. Even the most carefully-chosen comprehension questions and assessment tasks will not give you the information you need, if the listening or reading text is too advanced for learners, overwhelming them with unfamiliar language or cultural references, or too simple, not allowing them to show their full abilities. Communicative pressures — length of the text, formatting features (for example, the size of the font, the amount of white space on the page), and visuals. Topics should be generally familiar, an aspect of Cognitive Complexity. In addition, the CLB Support Kit (CCLB, 2012b) provides exemplars with corresponding (benchmarked) tasks that provide a general indication of what a person might be able to do at a certain CLB level in reading or listening. Adjusting the Text: To adapt the text, you could consider adjusting the text itself, or the support you provide for it. To simplify a reading text, for example, you could delete complex sections; in a listening task, you might have learners listen to the text in sections, pausing for interpretation or support. Alternatively, you could adjust the support / scaffolding that you provide: supplying visuals, pre-teaching vocabulary, or providing a glossary. Adjusting the Task: You could also make changes to your assessment task, either in terms of process, or in terms of your expectations for learner responses. To simplify the task process when using a challenging text, you might restrict what learners are expected to comprehend, perhaps asking only literal or interpretive questions. You could also adjust what you ask learners to do, perhaps using simple response formats (like red light / green light cards, true/false questions) rather than more complex written short or long answer response formats (adapted from Light, 2012). These adjustments are similar to those described in more detail in the context of assessing skills in multi-level classrooms, presented in Chapter 5, Adapting Assessment for Multi-level Classrooms. 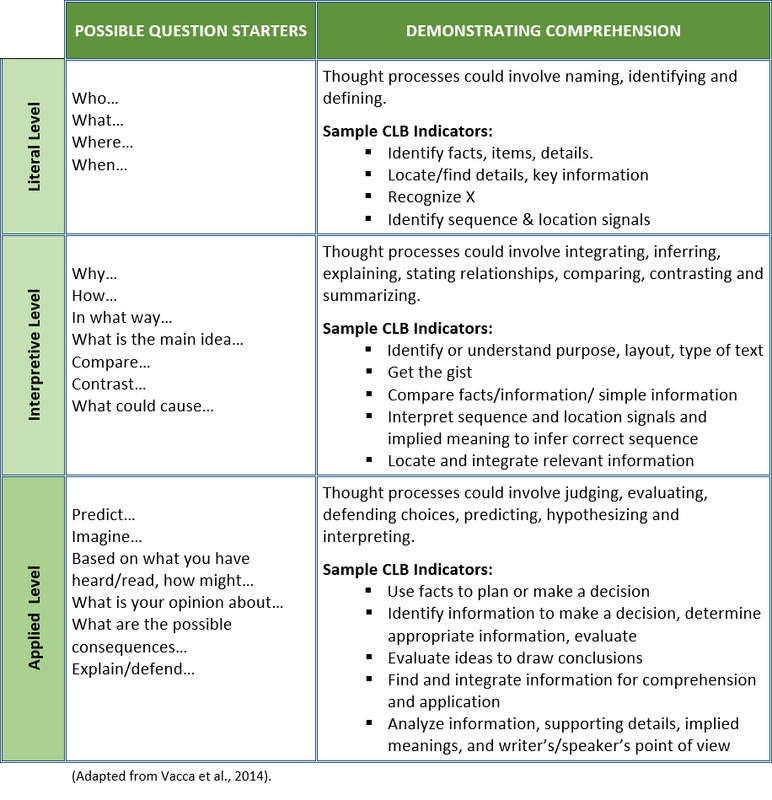 With a colleague, choose a set of comprehension questions for a reading/listening text and decide which level of comprehension and which CLB criteria each question addresses. Consider one of the listening or reading texts you have used recently as part of a learning or assessment task. With a colleague, brainstorm how you could adapt the text for lower level learners by 1) simplifying it, or 2) providing scaffolding for it. Vacca, R.T., Vacca, J.L., & Mraz, M. (2014). Content area reading: Literacy and learning across the curriculum (10th ed.). Boston, MA: Pearson.